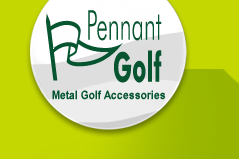 Solid Brass Divot Tool With Money clip Back - GD0961F - Our most popular divot tool. Made from solid brass with a spring money / belt clip back. Super strong rare earth magnet. 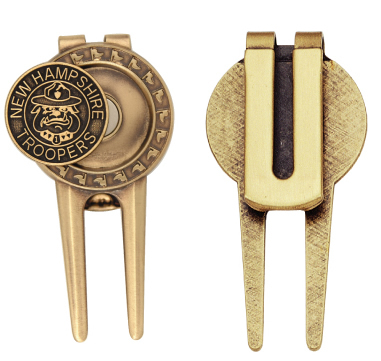 Brass Divot Tool with Plain Back - GD0967F - Similar to the two above models. Die struck in solid brass but back side is plain. 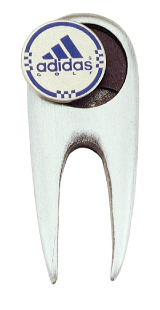 Die cast divot tool - GD0161F. 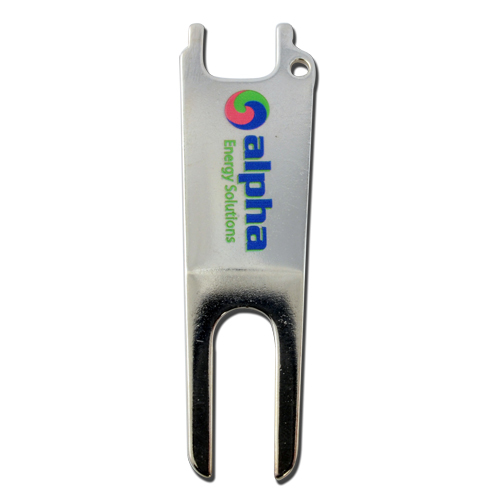 The GD0161F is an economical, divot tool offering outstanding features including: Super strong rare earth magnet, a putter holder or cigar holder on the top. May also be attached to a keyring. 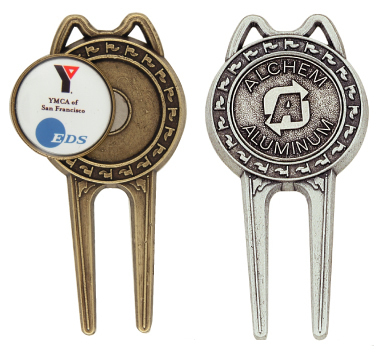 GD3000C - This sleek styled divot tool comes with a 3/4" ball marker. The rounded contours of this tool give it a unique feel in your hands. Economy Divot Tool. - GD2524U. Die stamped in iron and given a bright nickel or bright gold finish. 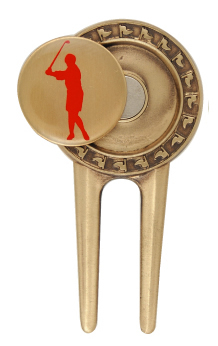 The top functions as a cleat tightener, as well as a cigar or putter rest. This tool may also attach to a keyring. Comes standard with a full color imprint.